Sewer lines remove waste and maintain a clean environment in commercial properties but over time, these lines can break down and become damaged from frequent use. When lines aren’t fixed in a timely manner then they can create serious problems. Leaking or clogged sewer lines can back up, causing sewage and other waste to spill, or fill the area with the noxious smell of sewer gases. That’s why at Schlueter Plumbing, we provide commercial sewer repair, helping you avoid any problems with your sewer line before they occur. Whatever the issue, our skilled plumbers can identify the source of the problem and fix it immediately. At Schlueter Plumbing, whether it means replacing the pipe or pipe-lining repair, we’re committed to resolving any issues. We’ll eliminate the source of the problem and take the necessary steps to help prevent further damage from occurring. We perform backflow testing and do a full-service drain cleaning and repair. Our maintenance programs can help identify any problems that might cause issues in the future. With over 60 years in the business, Schlueter can help all of your plumbing issues. We offer a 100% satisfaction guarantee. Customer satisfaction is of the utmost importance to us and if for any reason you are not satisfied we will work to resolve your issues. We service the great Cincinnati area, which means if you have businesses in Hamilton or Butler County in Ohio or Dearborn, Franklin, or Ripley County in Indiana, we’re here for you. Contact us today to schedule an appointment or call us today at 513-771-7588. Clogged or broken sewer lines can be a problem, and if they aren’t fixed immediately, it can lead to big trouble. Schlueter Plumbing is committed to providing the highest level of service possible which will provide you with peace of mind. That’s why our 100% guaranteed service covers residential sewer repair. Multiple Drainage Issues – Clogged drains are a common occurrence in many households, but often it’s only limited to one drain. However, if water drains slowly throughout the house or you’re experiencing clogs in multiple drains, this may be a sign of a blocked sewer line. Wet Spots In the Yard – Residential sewer lines are at risk from the elements and can become broken or damaged by shifting soil, tree roots, or frozen ground. This causes the pipe to become bellied, leading to water collecting around the collapsed area of the pipe, resulting in wet spots. Unpleasant Smell – While you may not always see signs of a problem with your sewer line, you may smell them. Potent sewer gases may become apparent and depending on the source of the smell, may identify the problem. Blocked drains will cause gases to permeate through drains, while line breaks or leaks are most noticeable in your yard. We’re committed to resolving your plumbing issues, our skilled plumbers will identify the source of your problem. 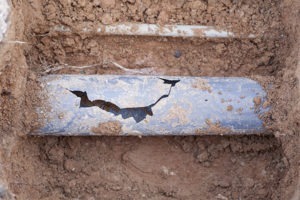 The flexible liner tube is made of fiberglass or polyester and is inserted into the damaged pipe. Filled with an epoxy resin formula for sealing the crack or leak, the liner is inflated once it’s fitted into place and allowed to harden by the application of heat through hot water, steam, or exposure to UV light. This process is a cost-effective alternative to replacing your sewer lines and is minimally intrusive with little damage to your yard. For over 60 years, Schlueter Plumbing has been proud to serve the greater Cincinnati area for all your commercial and residential plumbing needs. We’re committed to quality, that’s why we offer a 100% quality guarantee. If you’re not satisfied, we’ll do everything to make it right. Schlueter Plumbing are qualified professionals that are committed to providing you with quick solutions. Call us at 513-771-7588 to schedule an appointment. Follow us on Facebook to see our recent jobs with up to date pictures.